Now, granted, I have an intense bias. I love Maine. Everything about it. The ocean. The lobster. The osprey. The way the salt sticks to you like powder and the way the lobster boats hum in the morning. It’s utterly delicious. 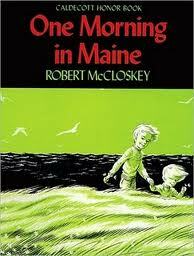 So, of course I’m going to adore the quintessential Maine writer, Robert McCloskey. It sort of goes with the territory. But you don’t have to love Maine…heck, you don’t even have to be able to find Maine on a map..to love Robert McCloskey and his brilliant ode to The Pine Tree State, “One Morning in Maine.” You might recognize Sal from her adventures in Blueberries for Sal (plink, plank, plunk) and this time she’s going on another adventure to Buck’s Harbor with her father and little Jane. The simplicity of the day – a loose tooth, a loon on the water, rolling up her pants to dig clams – all make for a magical McCloskey day matched beautifully with his black and white pencil illustrations. If you’ve never read this book, please do. It’s not only a Caldecott Honor book, but it’s the kind of book you don’t find every day…magical for no other reason than it just is.